Why Mama Regina for Queen Maria? 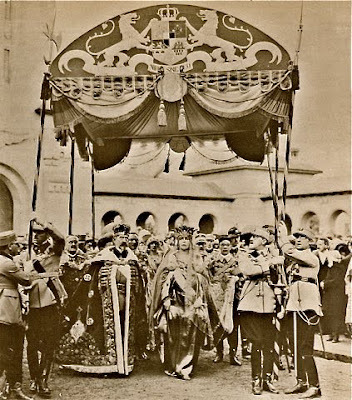 This is a picture of the Crowning of Queen Maria and King Ferdinand of Romania. They became King and Queen upon the Death of King Carol I in 1914. Carol I didn't rule over Transylvania as King, but a smaller part of what is now Romania. But here is the question: Many Romanians called Queen Maria Mama Regina why? And what did they call her husband? What a fabulous photo! Looks like a Peter Sellers movie, doesn't it? on second look it does doesn't it.